Light therapy is all over the place in beauty parlors and salons since it can help with smile lines, tighten up your skin, grow hair, reduce inflammation and much more. Normally this sort of treatment is something you would find in a salon that comes with a hefty price attached for a one-time use by a professional. Once you understand how it works though (full comprehension, not just a basic understanding), there’s no reason you shouldn’t be able to buy and install a system for yourself. The Phototherapy Shower Head by Linno Beau will let you kill two birds with one stone, by putting the light therapy technology inside of a shower head so you’ll get squeaky clean while tackling any skin issues you might be facing. 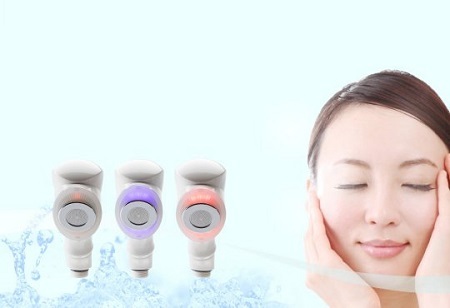 There are three modes, which includes the near-infrared LED for smile lines, skin tightening, spots and pores; red LED for small wrinkles, skin lift-up, and black circles; or blue LED for inflammations, acne, secretion control, and regeneration. You only need to replace your shower head and it will start going to work on your skin when you shower. It has a heat resistance up to 140 degrees Fahrenheit, so don’t try to scald yourself, or your light therapy will stop working. There is no mention of batteries, but there is a recommended water volume that most people are probably not going to pay attention to. This will cost you $511, and will hopefully last a long time since the bulbs are not likely to be something you can replace.